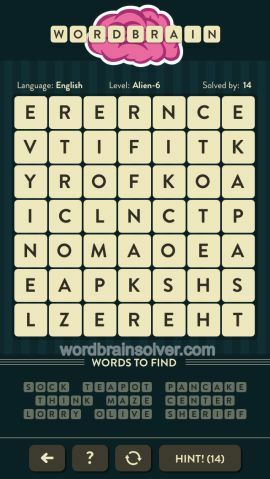 Wordbrain Alien Level 6 Answers and Solutions. This doesn’t work. I got all the way to ” Lorry and it won’t accept lorry. When I use a clue it says the word starts with g. There is no g in this level. It’s Giant instead of Lorry. Level 6 has the last letters r s i r p i t there’s two eyes in there it doesn’t fit can somebody help me please.